In general, to "optimize" means to achieve the best possible outcome, based on the stated objective and any restrictions that apply. In standard economics a typical optimization involves the maximization of utility within the restriction of a financial budget. In ENL, optimization refers to the extraction of the greatest possible health from an economic activity, without regard to environmental limits. More specifically, ENL's optimization answers the following question: for a given final output, what quantity should be produced during the period in question so as to maximize gains? This question is considered first with respect to the short run, during which the value and cost curves are fixed. It is then considered with respect to the long run, where basic economic conditions can be modified, thus allowing the curves to change their positions and shapes. The distinction between the short run and long run is an important one, which needs clarification. The short run is distinguished by changes that are predominantly behavioral rather than physical. At least in principle, a society could one day decide that it was drastically over-consuming, and immediately lower its consumption level. This would quickly reduce the natural flows associated with its production and consumption. Output quantities and natural flow rates can thus change in the short run. This is also true for distribution, which is driven by considerations of fairness and equity that could shift rapidly. Population change is clearly in a different category. Sharply reducing a society’s population would entail not just behavioral modifications, but also the physical realities of births and deaths. Similarly, changes in potential value and input cost typically require physical modifications to production methods, as well as technological changes that depend on the physical processes of experimentation and testing. This means that population, potential value, input cost, and technology are in the long-run category. Technically speaking, optimization applies only to final outputs. This is because the method deals with gains, which require the availability of both effectual value and input cost. An intermediate output is not directly consumed and therefore does not result in effectual value, which means that its optimum quantity cannot be directly defined. However, it is convenient to relax the terminology here and to apply the term "optimum" to intermediate outputs as well. Optimization requires the consideration of life-cycle input cost. This is the inclusive interpretation of input cost — the aggregate of all five life-cycle stages, from resource extraction to disposal. Unless specifically stated otherwise, this is how input cost should be interpreted in this section. To begin, note that the value and cost curves can be combined in a single graph, as shown in the following figure. This diagram shows all the value and cost curves. 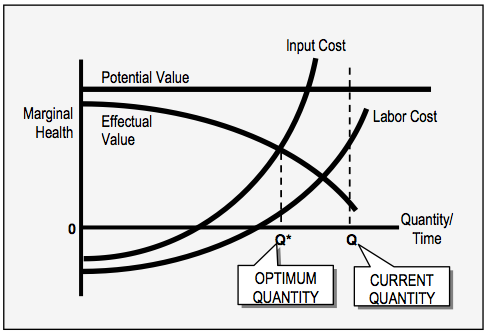 For many analytical purposes, only the effectual value and input cost curves are relevant. Q* denotes the optimum quantity, which in ENL's case means the health-maximizing output quantity. Q denotes the current quantity — that is, the quantity actually being produced during the specified time period. In the figure, the current output quantity is higher than the optimum output quantity. The above graph includes four curves, which explicitly depict the two types of value and two of the three types of cost. Natural cost is also present, but as an implicit quantity — the difference between the input cost and labor cost curves. However, for many analytical purposes only the actual health effects are relevant, and in such cases this graph is unnecessarily complex. Potential value refers to possible health rather than realized health, and labor cost is just one component of input cost. Thus, when analysis requires only the consideration of actual health, both of these curves can be omitted. For simplicity this is done in several of the discussions in this section. The other curves are included when the long run is considered and all relevant economic factors must be taken into account.